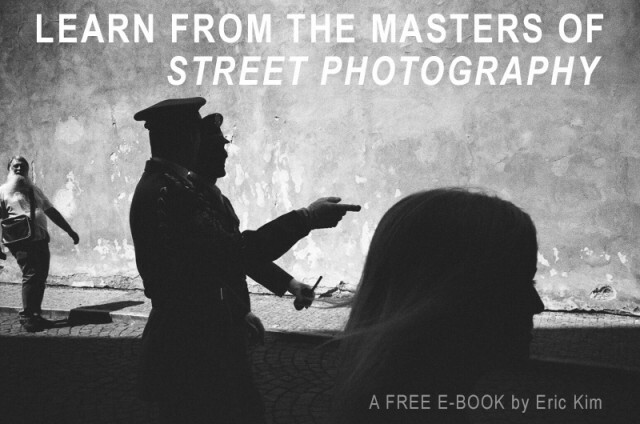 Eric Kim has written countless blog posts describing the lessons he’s learned from the work of master street photographers and he’s compiled those lessons into his free street photography eBook, “Learn From The Masters Of Street Photography”. It’s 250 pages of insight and lessons that are appropriate for street photographers of all levels. 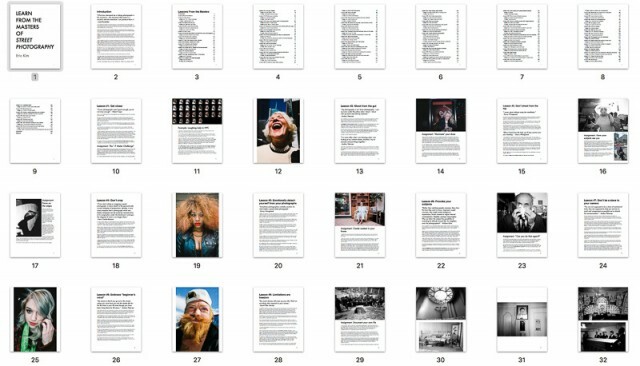 Unlike other free eBooks whose text seems to only exists to occupy space, Eric’s free street photography eBook takes a lessons based approach and includes assignments that work hand in hand with each lesson. But this isn’t another street photography manual that claims to make you a better photographer. The only way to make that happen is to keep shooting. A lot. Eric discusses how this quote applies to street photography and suggests the eBook’s first assignment, The .7 meter challenge. 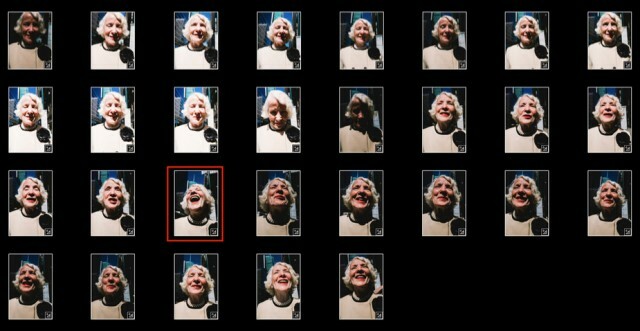 Set your lens to .7 meters (about an arms length away) and force yourself to only shoot subjects at that range for a full month. 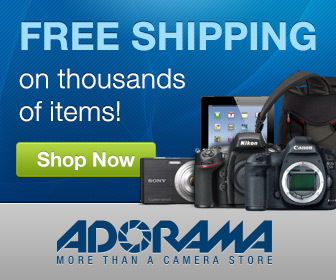 It’s a great way to get over your fear of photographing people by throwing yourself into the figurative deep end. 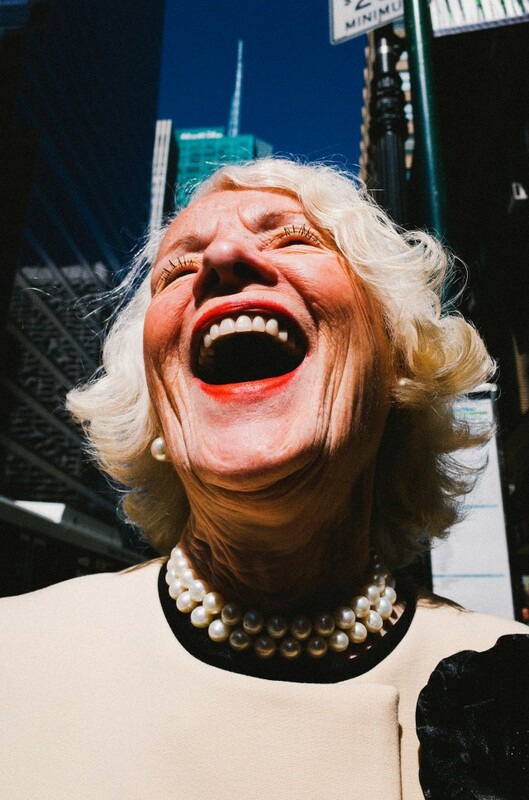 Eric backs up the assignment with an example that’s one of his favorite street portraits. Dicsussing how getting closer let him interact and really connect with the woman in the photograph and ultimately get the shot. Eric uses a anectodal approach to each lesson and his writing style gives you the impression that he’s in the same room with you discussing each assignment. It’s enjoyable from start to finish and there are 81 lessons and assigments to keep you going. Eric is very firm in his conviction that his work be available to everyone without cost. This goes for his images (which are available full resolution on his Flickr stream) as well as his latest eBook. But a book like this takes a lot of time so he’s releasing it on a pay what you want model that includes free. Eric Kim is a friend of the blog and over the past couple of years we’ve become friends in the real world. One thing that has always stuck out for me is his passionate devoition to teaching for the sake of knowledge alone. 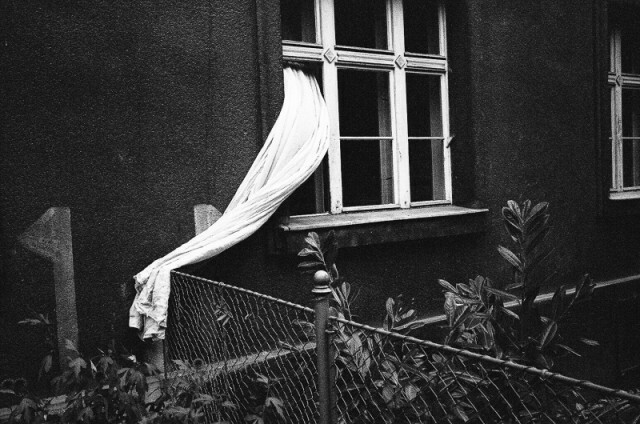 He sees street photography as a tool that allows people to grow within themselves and that really does drive his actions. Making the eBook open source is a testament to how hard he’s willing to work to spread his knowledge and help others find their own unique voice and vision as a photographer. Have a look at the free eBook. Dowload it. Put it on your iPad. Learn from it. If you like it then make a donation!